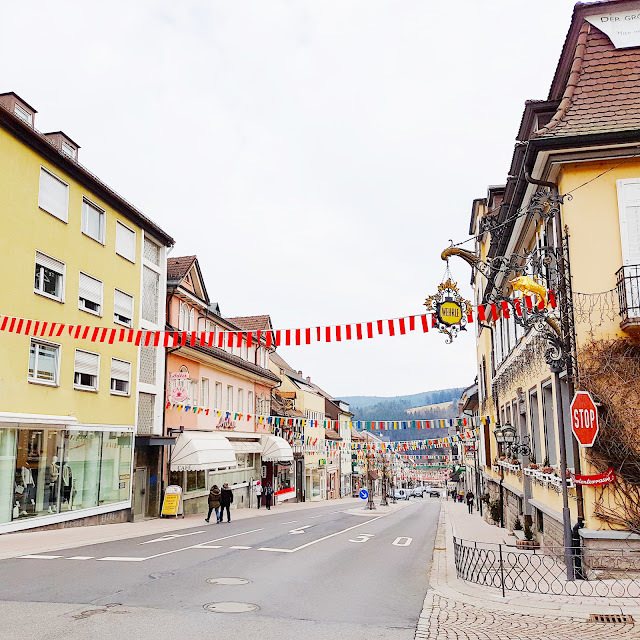 Deep in the heart of the Black Forest, our next stop of Triberg is a mid-sized town that takes excellent advantage of its cuckoo-clock heritage. The Gutach River flows through town after tumbling down Germany's highest waterfall just upstream. We were here for the goods: cuckoo clocks. We've been looking forward to getting a traditional German cuckoo clock since we moved here! Fox and Jane in front of the fun facade of House of 1000 Clocks. 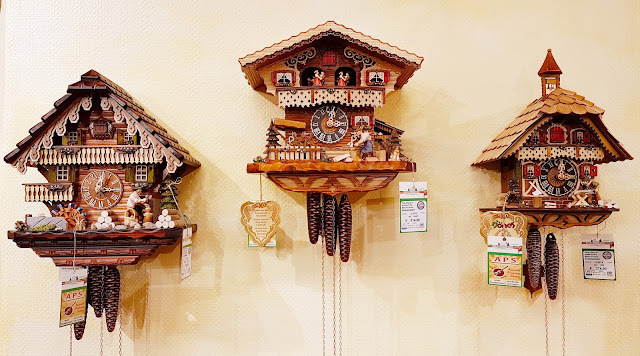 We learned from the museum in Furtwangen that the cuckoo clock as we know it was created for a contest in 1850 by Friedrich Eisenlohr. He was a railway architect and modeled his Bahnhäusler clock design after a railroad house. 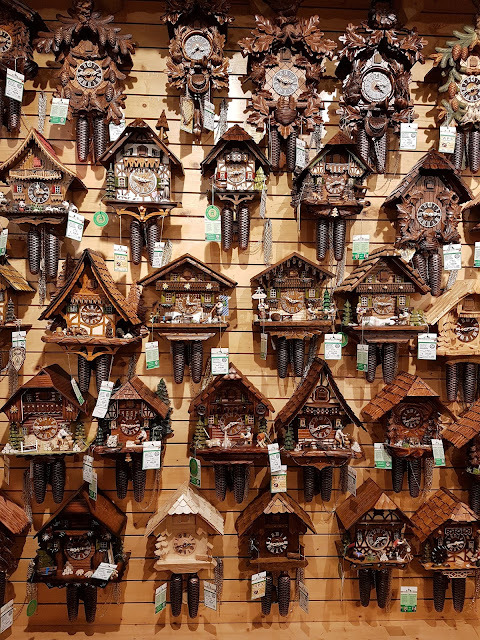 His idea of shaping a clock like a little house revolutionized the cuckoo clock making industry. These clocks became incredibly popular, especially among tourists during the late 19th century heyday of the romantic "Grand Tour" era. I'd say this store lived up to its name. Clocks for days! We browsed for awhile and a helpful worker explained the differences between the clocks: mechanical vs. battery, 1 day vs. 8 day, two weights vs. three, etc. We decided we wanted a traditional mechanical clock rather than battery operated, that we liked the smaller 1 day weights, and liked the clocks that had the cuckooing AND music. Here were our final three choices. We went with the one on the left. Here is one of the two songs it plays. The other is Edelweiss which makes my heart so happy. After getting our clock, we went back out to explore town and get some lunch. 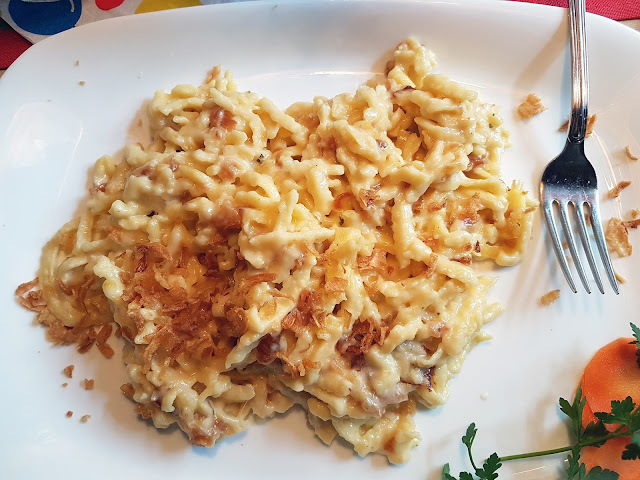 Lunch at a German restaurant means: Käsespätzle! For the last 4 years as we've traveled around Germany, we've seen cuckoo-clock-shaped magnets e.v.e.r.y.w.h.e.r.e. 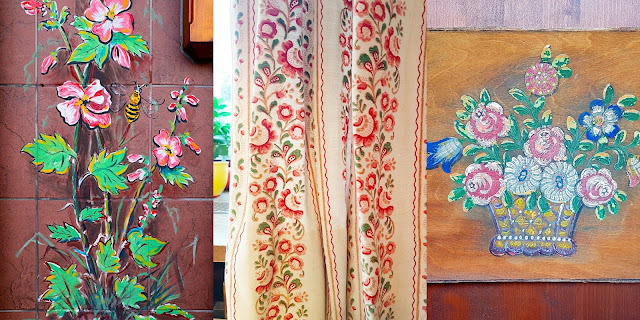 In Berlin, Munich, Hamburg, etc. etc. etc. 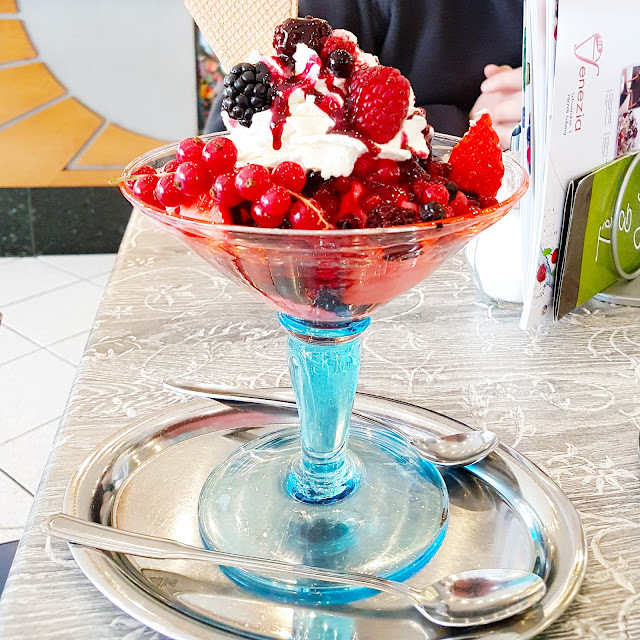 We never got one of those because we were waiting until we were actually in the Black Forest to get one. Finally our time had come! 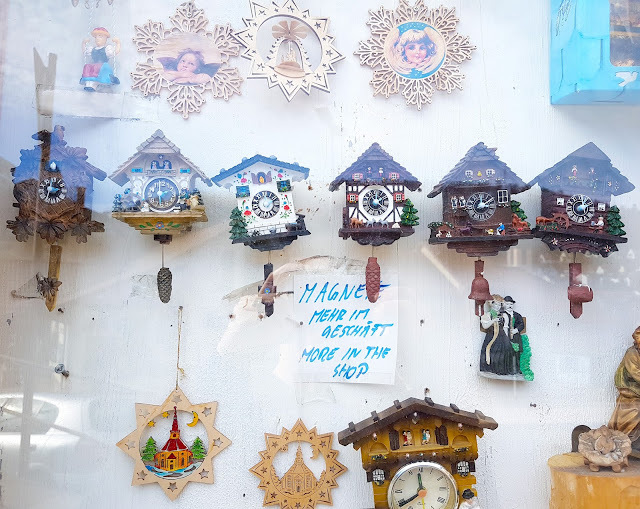 A cuckoo-clock-shaped magnet from the origin of the cuckoo clock. Looking across town. The Black Forest Museum was closed the day we were here, but we already got a nice dose of the region's heritage at the German Clock Museum earlier in the day. More shops selling the regions woodwork, clocks, and more. Aside from the clocks, the other big draw to the area is the Triberger Wasserfall. The trails around the waterfall start right off the main street in town. The Evans Family in the Black Forest in front of the Triberger Wasserfall. The Gutach River tumbles 500 feet down in several bounces. 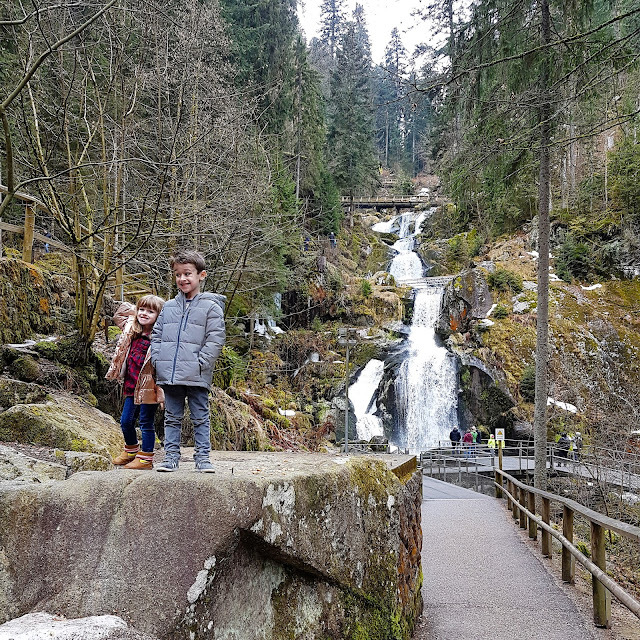 Video compilation of the beautiful Triberg falls. Don't you just love the sound of falling water? :) Kids. 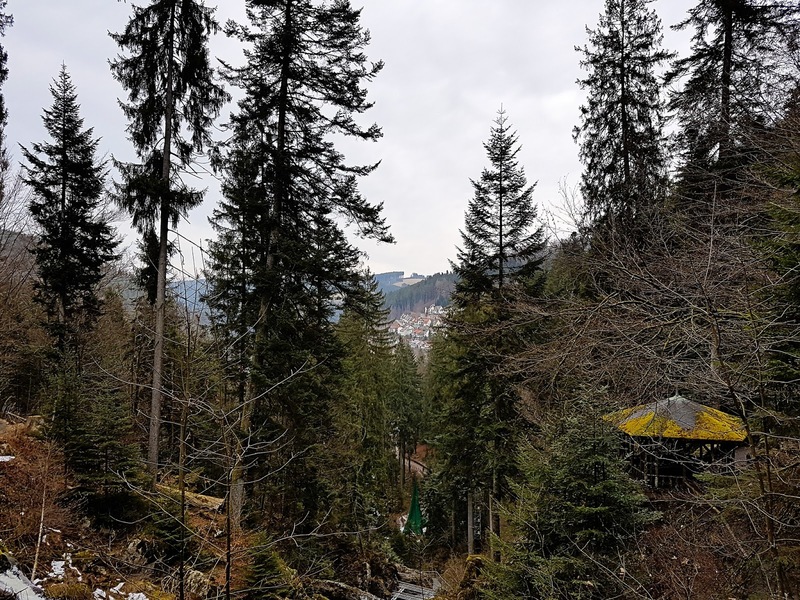 Looking back down on Triberg from up the gorge. Aside from the couple patches of ice that were suuuuper slippery and honestly a little scary lol, it was a fun hike! Back into town we went after conquering the falls. Jane boppin' along to the beat of her own drum. Our tummies decided they wanted some ice cream so we went hunting for a place to satiate our craving. Stopping to admire the iron signs. Success! 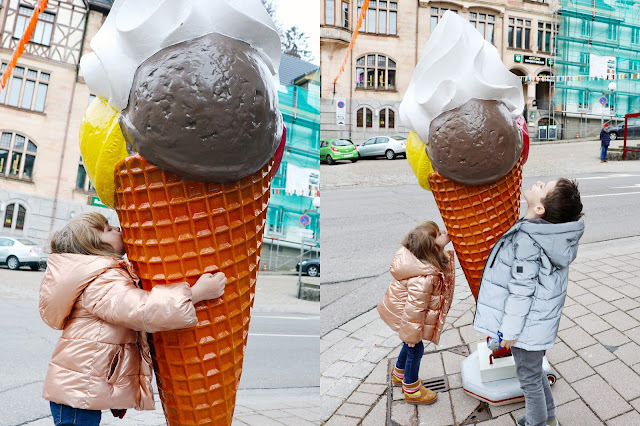 The kids got a couple scoops each. Chris and I split this in-cred-i-ble wild berry sunday. It was so good. Almost worth driving 4 hours back for good. In memory of Grandpa Tedder the Gooder and Better. Adorable Triberg! 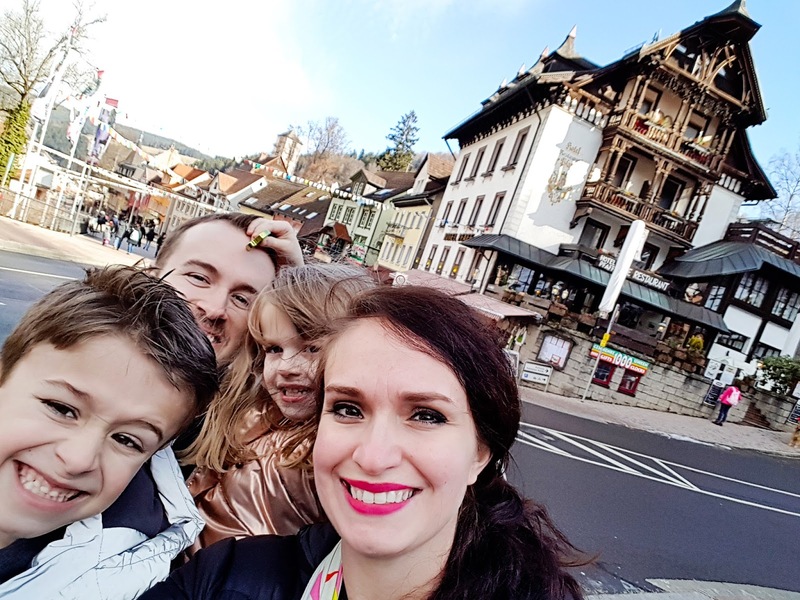 Our family in Triberg, Germany on Sunday February 19th 2017. Last adventure of this trip coming soon: Baden-Baden! What a fun town! LOVING the clock you chose!!! And loving those falls!! GORGEOUS!!!!!! !